Start the clock. A new USC offensive coordinator has been named. Graham Harrell, who produced national Top 25 offenses the past 2 seasons while the OC at North Texas, has been named the Trojans‘ offensive coordinator and quarterbacks coach, head coach Clay Helton announced Wednesday. Harrell, 33, was a record-setting, award-winning quarterback at a Texas high school and at Texas Tech, then earned a Super Bowl ring as a member of the Green Bay Packers before pursuing a coaching career. Harrell took a UNT team ranked in the bottom 25 nationally in scoring and in just two years as the OC improved it to 19th. In the process, quarterback Mason Fine set school records for passing (2,052) and TDs (31). 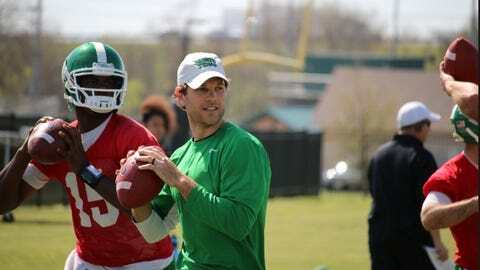 In 2018, UNT ranked 12th in passing (306.8), 20th in total offense (460.5) and 26th in scoring (34.6), with Fine throwing for 3,793 yards and 27 touchdowns to just 5 interceptions. North Texas also rushed for more than 150 yards a game in both 2017 and 2018. UNT won 9 games each of the past two seasons and qualified for bowl games each year that Harrell was on staff (2016 Heart of Dallas, 2017 New Orleans, 2018 New Mexico) after having only played in one bowl the previous 11 seasons. Harrell also has experience coaching in the PAC-12. Prior to his three-year stint at North Texas, he was the outside receivers coach and offensive analyst for two years at Washington State under Mike Leach, his former collegiate head coach who introduced him to the air-raid offense. Harrell was a record-setting quarterback for Leach at Texas Tech from 2005 to 2008, finishing his career with an NCAA-record 134 touchdown passes, the second-most career yards in NCAA history (15,793) and the third-highest career passing average (351.0). He also set NCAA career marks for pass completions average (31.2), as well as most games gaining 400-plus passing yards (20), games gaining 400-plus total yards (21) and seasons gaining 4,000-plus total yards (3). His career average of 486.3 passing yards against Texas was an NCAA record against one opponent. In each of his three seasons as a starter, his passing yardage figures placed in the Top 25 all-time at the FBS level (21st in 2006 with 4,555 yards, second in 2007 with 5,705 and sixth in 2008 with 5,111) and he was the first player with a pair of 5,000-yard passing seasons. In 2008, he finished fourth in the Heisman Trophy voting. He will be responsible for helping to groom sophomore quarterback J.T. Daniels after an up-and-down freshman campaign. After becoming just the second true freshman to start a season opener for USC, Daniels averaged just 242.9 yards per game and had 14 TDs to 10 INTs in a season the Trojans finished with a 5-7 record. Now with Harrell signed aboard, he just needs to last until March 6 to surpass his predecessor’s, Kliff Kingsbury, tenure.